Good evening -How can you possibly not like pansies? Their little faces look up at you so beautifully when in the garden and the colours are amazing.I have lovely blue lupins sprouting in my small frame but the self sewn one on the path already has a flower on. I am eating broccoli and my caulis are coming soon after. Sopring onions up and lettuce and my new Black Boy peach is flowering I now have two as I love them so much and they freeze well. My Arigula has served me well all winter and is thriving. I just don’t like plants that sit so close to the ground – pansies just end up splashed with mud every time it rains. They are nice in containers though. Your garden sounds like it’s going great guns. My ‘Black Boy’ peaches from last year are budding up but haven’t burst yet. Can’t be far off though! Hi Ann, Your growing a Black Boy peach…I have looked high and low for this tree. Do you know where I would be able to purchase this tree? Slugs and snails hate me and my plants in pots, whether they are seedlings, vegetables, herbs or flowers, because I know of a demon deterrent — petroleum jelly. The slimy ones absolutely will not cross it to gnaw on a plant, no matter how tempting it is. But I have never found a good way of transferring the petroleum jelly technique to my in-ground garden. On my pots, I finger-stripe the jelly in an unbroken circle around the pot somewhere, usually near ground-level. It is clear, so it is not unsightly. If the pot is near a wall the gliders may climb to outwit me, I’ll put another stripe of jelly on the pot near the wall to deter them from crossing onto the pot. Any ideas about how to transfer this handy deterrent to a full-scale vege garden — it would save so many seedlings, if nothing else! Buy shares in Vaseline? (Heh, just kidding.) That’s an interesting tip. I’m hopeless with plants in pots but I’d love to see the slimy sods slipping down the slimier jelly…. Uh oh. I thought they might be. Our Pekin ducks are cute as, but completely pointless. They cost a fortune in chook food and are *quite* insistent if I don’t feed them. Hello Lynda, Sian from Pukekawa here. I have raised a heap of tomato seedlings and potted them into bigger pots. When would you think the best time to plant them into the main garden would be? I have also cleared a large raised bed of a very strange shape and I wondered what would be a good thing to use to walk in between the patches? Do you spray your peach trees? Crikey lots of questions but the climate wouldn’t be too different in Hunua would it? Tomatoes can be planted now if it is reasonably sheltered or you can protect them from the wind, as the wind still has a bit of chill in it still it will damage the leaves. Peach trees can do with a spray pre bud burst or when the buds swell a lime sulphur spray helps to reduce curl leaf and black spot in fruit aftyer bud burst at new leaf stage copper or similar mixed at the recommended rate on the bottle , again to help control leaf curl and blackspot. We’re still getting frosts here so I’ll wait a few more weeks to get my tomatoes in. The peaches, peacharines and apricots are in blossom now. Can’t wait to get the first crops off them this summer. Wait till Labour Weekend. It’s still too cold at night for tomatoes. Do you mean some sort of path material, like mulch, to walk on? Or pea straw? I haven’t sprayed my peach trees this year, but I should have. Copper’s all they need to stop leaf curl and brown rot spores. Wow you have been industrusteous, I hope the result is successful – you make me feel lazy but I do not feel confident planting seeds and buy seedlings of flowers, I must take the plung oneday. I have bought dozens of punnets of flower seedlings this season. I’ve never really bothered with bedding flowers before but I’m having fun popping them in between the rows of veges. And now I’m recycling all the empty punnets by sowing flowers too. It’s a whole new ballgame. My rudbeckias have just germinated and they are like small green specks – I really can’t see how I’ll be able to nurture them from such tiny things into fully grown plants by summer. So far I haven’t spotted any obvious duck damage. I watched them waddle through my potato patch this morning. We’ve mounded up the plants and they appeared to be doing their best to unmound them. Digging for worms maybe? Do ducks eat worms? Heh. Except, Jude, Mum says I willingly ate pumpkin as a baby. It’s only now that I loathe the stuff. I guess if you’re right I can always feed it to the cows. Mashed swede is 100 times nicer if it’s cooked with and mashed with carrot and a knob of butter or suchlike. That’s how I got my husband to eat it. Boy, veg are eye-wateringly dear to buy. My normally dependable beetroot, seedlings planted before winter, are still more or less roots, about twice the thickness of a piece of spaghetti. I can’t figure it out. Did we have an unusually dry winter? Beetroot prefers wet, warm weather; sow some more now and they’ll swell up quickly. Susan from Dunedin here. Just wanted to tell you how much I’m enjoying your blog. I have a class blog as I teach five year olds, and know how much work is involved in keeping them current. I have recently watched your Get Growing TV series ( both families) and found them very inspiring. My 13 year old daughter loved it too so here’s hoping she’ll love gardening one day. I didn’t develop the interest until an adult despite my mother and grandmother being “experts”. I am now really jealous of the gorgeous garden you’re developing on the farm. My husband and I would LOVE a farmlet and hope to purchase one before we are too old to do the physical work involved. ( We are ONLY in our 40’s !!!! So a bit of time yet I hope.) I love the idea of making the garden as big as you want because of the seemingly endless space available when you have “land”. At the moment I need to be content reading about the wonderful areas you are developing. I love the garden you are developing on the horse arena and will look forward to seeing it develop. 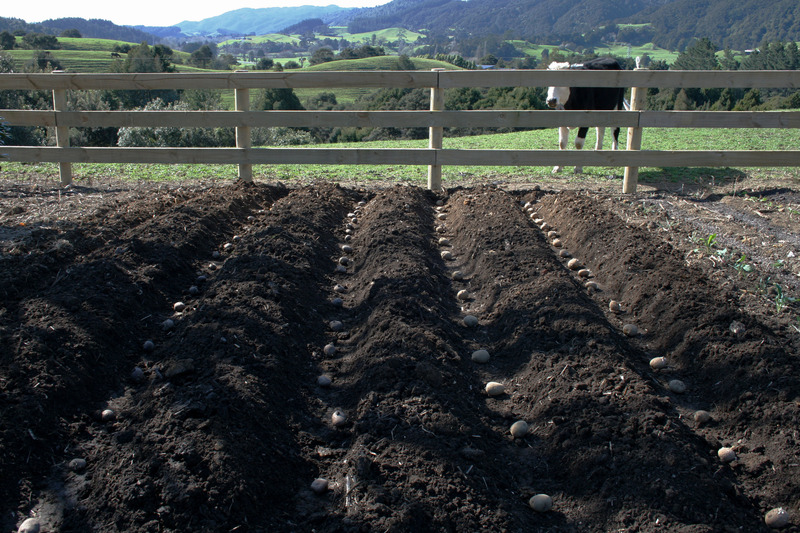 Lynda, your photo of the potatoes ready to plant in the trenches. Do you just cover them where they are, or do you put them into the mounded up part? They seem close – how much? Maybe I’m planting mine too far apart. How are you going to deal; with psyllids? (I hope you don’t have to?